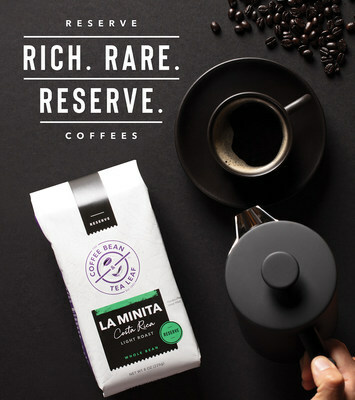 LOS ANGELES, U.S. — The Coffee Bean & Tea Leaf, one of the world’s leading roasters and retailers of specialty coffee and tea, announced today the relaunch of its renowned Reserve Coffee Line. The classic coffee varieties – 100% Kona, Jamaica Blue Mountain, and Costa Rica La Minita – incorporate the highest quality global flavors and are carefully curated to elevate the coffee experience. The Coffee Bean & Tea Leaf works directly with local growers to source the finest ingredients and flavors from around the world. The coffee pioneer only selects from the top one percent of Arabica beans from the world’s best growing regions, including Costa Rica, Colombia, Kenya, Indonesia and Jamaica. The Coffee Bean & Tea Leaf’s Reserve Coffee Line represents the most exclusive and rare Arabica coffee regions on earth. Because of their limited availability and unique regional conditions, these roasts embody The Coffee Bean & Tea Leaf’s commitment to delivering quality global flavors to guests’ local communities. 100% Kona: Grown on the rich volcanic slopes of the Hualalai and Mauna Loa volcanos in Hawaii, our authentic Kona coffee has a smooth body, nutty aroma and sweet finish. Coffee was first brought to Hawaii in the 19th century and the fine quality produced in the Kona districts have earned a reputation among the finest and rarest coffees of Hawaii and in the world. Unique microclimate, adequate elevation and volcanic soil are ideal conditions for coffee trees. The environment in Kona which this coffee grows gives it distinctive characteristics not found in coffees grown in other parts of the world. The beans that The Coffee Bean & Tea Leaf source are consistently recognized at coffee cupping competitions and by connoisseurs for their fine flavor. Jamaica Blue Mountain: Combined with its soft, lush Caribbean profile, this coffee has a spicy aroma and light body with a well-balanced flavor. Jamaica Blue Mountain Coffee is a Protected Designation of Origin and can only come from the defined boundary of the Blue Mountains in Southeastern Jamaica. Additionally, only coffee from above 1,700 meters in elevation can be labeled as Jamaican Blue Mountain. The Coffee Bean & Tea Leaf sources its beans from historic estates including Mavis Bank, Clifton Mount, and Clydesdale. The beans are entirely handpicked and only a limited number of pounds are produced per year, making it one of the rarest coffees in the world. Costa Rica La Minita: La Minita has long been considered by experts to be one of the world’s most exquisite coffees. Grown at the Hacienda La Minita in the Tarrazu region of Costa Rica, the coffee fruit is meticulously hand-selected, and only the perfectly ripe fruit is picked and inspected to ensure quality. Due to the incredible attention to detail at every step of processing and its very limited production, this brew is one of the most refined in the world and is smooth and full-bodied with an elegant, complex flavor. Everything from the planting of new seedlings to the final grading, bagging, and loading of the shipping containers takes place on the property and under the careful and expert management of La Minita staff. The Coffee Bean & Tea Leaf’s Reserve Coffee Line is available for at-home consumption in 8oz. whole bean packages. For more information, please visit www.coffeebean.com.